While you’re visiting the area, you’ll probably see some “interesting” words and ingredients on the menu. Here’s a list of Cajun cooking words and their meaning to help you navigate your way through our menu or through our delectable cuisine. 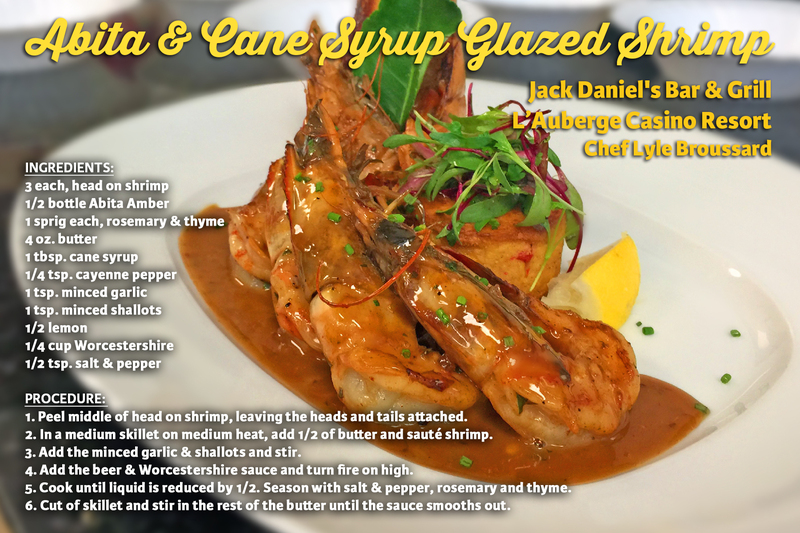 Share you culinary explorations with hashtag, #eatswla. Amandine (ar-man-deen) – a method of serving fish or seafood with a lemon butter sauce topped with toasted, slivered almonds. Andouille (ahn-doo-wee) – A lean, spicy, smoked Cajun pork sausage that adds great flavor. Beignet (bin-yey) – Square French doughnut, deep-fried & dusted with powdered sugar. Bisque (bisk) – A rich, thick creamy soup made from seafood In Cajun country; it’s usually made with crawfish or shrimp. Boudin (boo-dan) – A seasoned Cajun sausage traditionally made of pork, rice and spices. Boulettes (boo-lets) – Ground seafood, usually fish, crawfish, or shrimp, mixed with seasonings and breadcrumbs, then deep-fried in oil. The Cajun Trinity – The Holy Trinity of Cajun cooking includes celery, onions and bell pepper. Cane Syrup – An essential ingredient in Louisiana Pecan Pie and lots of other favorite Southern dishes. Cochon de Lait (coo-shon duh lay) – An event where a suckling pig is roasted over a blistering hickory fire until the inside is tender and juicy and the outside brittle as well-cooked bacon. Couche-Couche (koosh-koosh) – A popular Cajun breakfast food made by frying cornmeal and topping it with milk, coffee milk or cane syrup. Courtbouillon (coo-boo-yon) – A spicy Louisiana stew made with fish, tomatoes, onions and vegetables, and typically thickened with roux. Debris (day-bree) – A dish made combing the leftover parts of the animal such as the liver, spleen, intestines and the like with lots of onions. It has a delicate flavor and is served over rice. Dirty Rice – Rice dish sautéed with green peppers, onions, celery and variety meats. 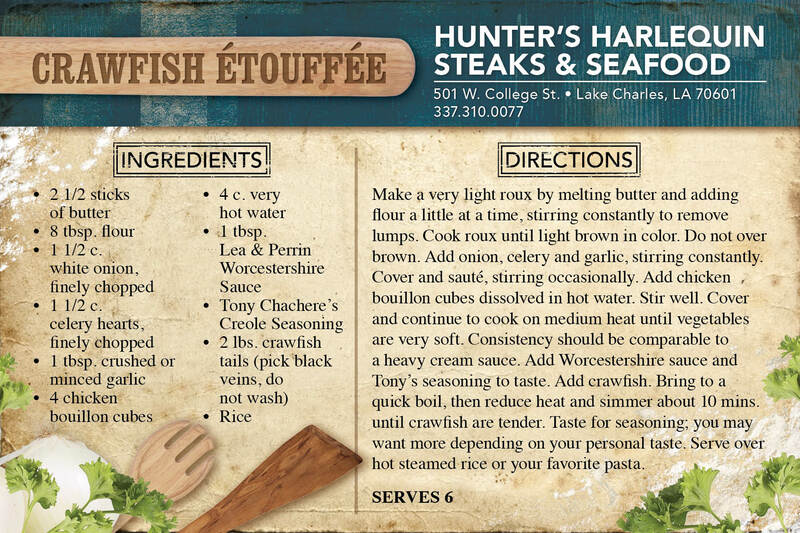 Étouffée (ay-too-fay) – A savory dish, usually made with crawfish or shrimp, prepared by simmering over a low flame. Filé (fee-lay) – Ground sassafras leaves used to thicken and flavor gumbo. Fricassee (free-kay-say) – A thick Cajun stew made with roux and any type of meat. Gateau de sirop (gat-tow d seer-up) – This word translates to ‘syrup cake,’ a moist cake made with cane syrup. Grattons (grah-tawns) – The Cajun word for cracklins. Grillades (GREE yads) – Beef or veal round steak, browned, and simmered until tender in browned tomato sauce served over grits. Gumbo (Gom-bo) – A deep rich Cajun stew often thickened with okra or filé. Some popular types are chicken and sausage, shrimp and seafood. Jambalaya (jam-bah-lah-ya) – A traditional South Louisiana rice dish, it is a well-seasoned mixture of meat, onions, bell pepper and rice cooked in a single pot. Maque Choux (mock shoe) – A Cajun dish of smothered corn, tomatoes, onions and peppers. Sometimes shrimp or crawfish are added to make a main dish. Pain Perdu (pan-per-doo) – Literally, “Lost Bread,” referring to the stale bread that would otherwise be thrown out, also known as French toast. Pistolette (pistol-let) – A small French bread that is cut and the middle scooped out so that it can be filled with a delicious Cajun favorite, such as crawfish étouffée. Praline (praw-leen) – A flat, smooth and creamy candy made with sugar, butter, milk and traditionally pecans, though there are many recipes with different ingredients. Remoulade (rem-oo-lard) – A spicy sauce used with shrimp and other seafood. Roux (roo) – A slow-cooked mixture of flour and oil. Adds flavor and body to gumbo and other Cajun dishes. Sauce Piquante (sos pee-kawnt) – A thick, sharp flavored sauce made with roux and tomatoes, highly seasoned with herbs and peppers, simmered for hours. Tasso (tah-so) – Thin-cut, highly seasoned smoke-cured ham. Used for seasoning in beans, gumbos, vegetables and many other Cajun dishes. Turducken – A unique “Cajun Bird” created when a turkey is stuffed with a duck which is stuffed with a chicken. And it’s also stuffed with lots of Cajun dressings and seasonings. Yam – A sweet potato-like vegetable, but usually sweeter.